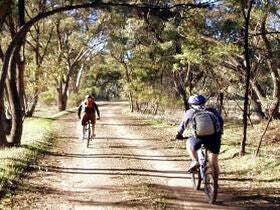 Bike About was first established in 1996 in the Adelaide Hills, South Australia, with the focus on outdoor education, physical education and school camps providing an educational, fun and health activity for our students. We specialise in mountain biking, mountain bike camps, cycling touring, bike hire and education. We offer a variety of mountain bike trips to suit a range of abilities and types of groups. Some include catering and accommodation, and some are simple day trips.